When a new baby arrives in the family or our circle of friends I like to be ready with a gift straight away. Sometimes this is easy if we know what gender to expect, sometimes a little trickier if we are to wait for a surprise. Patience isn’t one of my strong points but I think I’ve found something that makes a great ‘on hand’ gift; I can have it stowed away in a cupboard while I wait for delivery day. 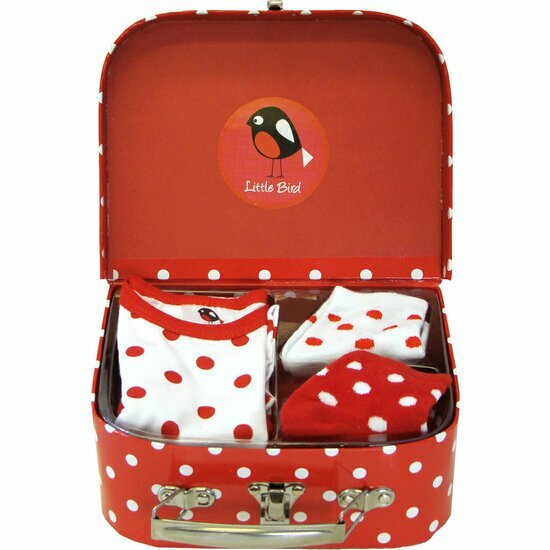 The Little Bird Gift Case from Annabel Trends makes an impressive gift in all its splendid red polka dot glory. It contains a unisex growsuit for babes sized zero to six months, plus two pairs of matching socks in a groovy reusable case (perfect for storing newborn keepsakes in) – all for a great price! You can order your Annabel Trends Little Bird Gift Case from Baby’s Got Style for just $32.95. Delivery is available all over Australia.